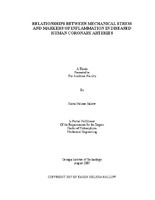 Relationships between Mechanical Stress and Markers of Inflammation in Diseased Human Coronary Arteries - Download this document for free, or read online. Document in PDF available to download. Rupture of atherosclerotic plaque is one of the primary causes of death due to cardiovascular disease. The factors directing plaque progression to instability are poorly understood. It is well-known that arteries respond to changes in mechanical stress by remodeling, and that remodeling is mediated by the inflammatory response. Studies have shown that both mechanical stress and markers of inflammation are increased in the fibrous cap and shoulder regions of plaque, where rupture most often occurs. In this study we hypothesized that there are spatial relationships between the local mechanical environment and expression of markers of inflammation in atherosclerosis, and that these relationships are plaque-progression dependent. To test these hypotheses, we analyzed cross-sections at intervals along the length of human coronary atherosclerotic arteries. For each cross-section, a heterogeneous finite element model was developed to determine the spatial distribution of stress. In addition, novel techniques for quantifying inflammatory markers at high spatial resolution were used to determine the distributions of inflammatory markers. The distributions of stress and five markers of inflammation activated NF-kB, macrophages, MMP-1, nitrotyrosine, and microvessels - were then compared to determine whether spatial relationships exists. We demonstrated that the probability of activated NF-kB expression increases monotonically with increasing stress in all stages of plaque progression. This indicates that the relationship between mechanical stress and NF-kB activation is a player throughout the disease process. We found that the relationship between mechanical stress and macrophages is highly dependent on the state of plaque progression. In intermediate stages of progression macrophages increase with moderate stress but drop off again at very high stresses, while in the advanced stage macrophages continue to increase monotonically with stress. We found that MMP1 increases with stress in stages of progression where active remodeling is occurring, but decreases with stress in mature stable plaque. We found no relationship between mechanical stress and nitrotyrosine expression or microvessels. Taken together, these results support the role of mechanical stress in instigating and maintaining the inflammatory response, and help explain how mechanical input is able to direct the complex biological changes involved in remodeling.